Up to 2,000 vibration-powered sensors are to be installed on the Mackinac Bridge in Michigan, USA, following successful testing of 20 prototypes. The 20 protoype sensors, which are powered solely by vibrations from traffic, have proven their durability and performed as intended since installation began in 2016. “We are very excited that this will be the first fully instrumented bridge in the country using advanced wireless and self-powered monitoring technology,” said Michigan State University (MSU) associate professor of civil and environmental engineering Nizar Lajnef. Researchers from MSU and Washington University in St Louis (WUSTL) are ready to roll out the next phase of testing, installing up to 2,000 sensors. The project has two aims: to both explore the logistics of a large-scale deployment and provide useful monitoring data to the Mackinac Bridge Authority. Lajnef added: "The successful large-scale deployment of this novel low-cost sensing technology will dramatically transform the economics of bridge preservation/management and ultimately improve the serviceability of bridges. 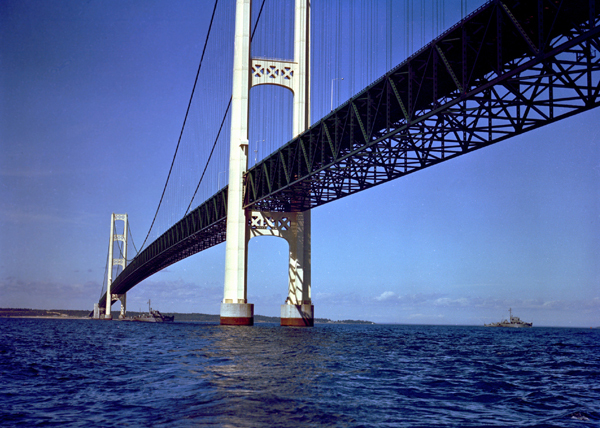 We also will explore how the collected data could be used for improved cost-effective, condition-based maintenance of the Mackinac Bridge structural components." Lajnef and WUSTL professor Shantanu Chakrabartty started the deployment in 2016 of prototype sensors beneath the bridge as part of a demonstration project sponsored by the Federal Highway Administration. "In addition to being a statewide need, the development of effective methods for preserving our transportation infrastructure systems is a critical national need," said Lajnef. "Through this large-scale deployment, we would show that the system can autonomously monitor the loading experienced by the bridge components, and that the information from the sensors can be collected without significant human intervention and at significantly low cost." The team plans to start installation of the additional and improved sensors this summer.